Having to reach into the Virtual Belly of the Dark Underground, Mandel Solano the installation creator, has struck a deal with "The Invisible Band" a dangerous but colorful group of rebel musicians who are wanted on outstanding warrants issued by the Galactic Federation Officials. The music described by the Federation is as Highly Charged as the speed of Light. Put on your boogie dancin' shoes & Be ready! LEA8 will be declared a safe zone for the band members in exchange for some delicate information given to The Federation by leader Alazarin Mobius that could quite possibly save our world. No Bounty Hunters Allowed during that time frame. The Band Biography promises to be an entertaining read and will be available the day of the Event. Mandel Solano is a Swedish VR artist that has done extensive original works with his very identifiable style using lights, mirrors, projections, shadowing, bumpy, shiny and a some original unique methods using his own textures. It is "Highly Recommended" to explore the multi level installation with a pre-visit prior to the special event. For those new to SL there is help available to set your Graphics to really consume the depth of this build. For the seasoned explorer, High Graphics is a must,,, Ultra is BEST and enable Sun, Shadows, Projections. The build was created using midnight, but you will always find something interesting experimenting with all the environment settings. There is also a short tutorial explaining the Graphics settings located at the bottom and top level of the build. For the photo enthusiasts this build promises to provide you infinite possibilities of a great photo ops. Be sure to grab one or all of the Free Light Hats that will reveal some very special surprises as you explore this build as well as a Free Face Light tester. 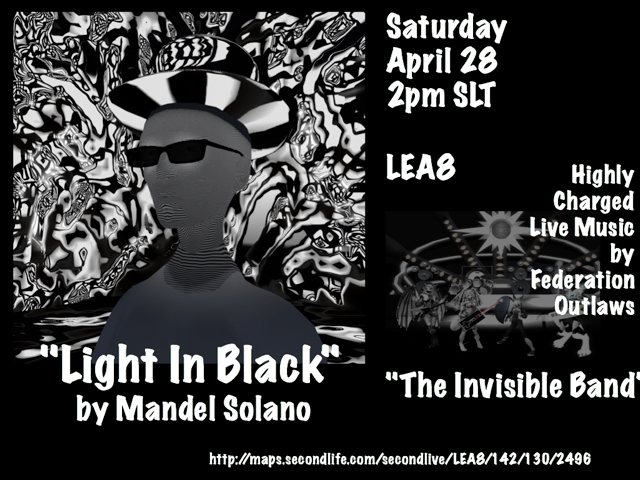 This live musical event will hosted by Mandel Solano assisted by the other two sim creators Ultraviolet Alter and Tansee.